I haven't been to any EDSA Revolution in my entire life. 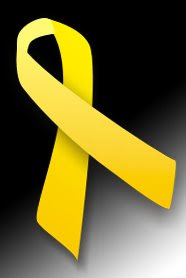 I was told, during that time, yellow ribbons were tied in every lamp posts all over the Metro. And here we are again, tying those yellow ribbons, not for EDSA Revolution, but for Tita Cory. Then I thought, does it have to take one person's life or health condition for us to unite and bring back what EDS Revolution brought our country? We fought hard, blood and sweat, for this. Yet, apathy is slowly killing us, tearing us apart. I say we need to get back on our feet, stand up, and do what a Filipino has to do. Let's continue what our forefathers have started. Let's take that one step to a journey of a thousand. Together, we'll make it through. Let's tie that yellow ribbon. For Cory. For us. For the country. Indie film industry has gone a notch higher. Thanks to Cinemalaya V (pronounced as Cinemalaya Cinco). This independent film festival, which started on 2004, goes up little higher, grows a little bigger this year with more captivating films, world-class and worth-watching. 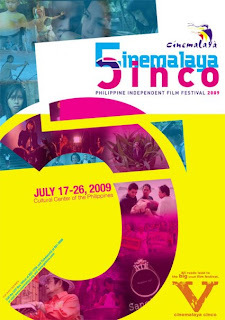 Observing what Cinemalaya has become from the time it started until now, it has surely gone a very long way. Being a film fanatic, I should say that the quality of films has also evolved - better, stronger. There were, of course, some film exhibitions that I doubted. But maybe, just maybe, I didn't get the film's essence. I know you might ask how many films did you watch? I was able to watch 24k. And Shorts B, including the best short feature, Bonsai. There, I can say that Cinemalaya truly grew to a sturdy tree. You can even measure it via the clouds and clouds of people who went to the venue. It was overflowing. Box-office as they usually say. Crowd's favorite was Dinig Sana Kita, this I have to watch and compare from Mike Sandejas' Tulad ng Dati. The Best Film went to Last Supper No.3, again, this I have to watch. My friends told me it's oh-so-uber-duper-funny. Even Erik Matti laughed with it. The one and only competition film I watched won Best Cinematography. I say. They deserved it. The film's crisp color and lighting was spectacular. Every little shot was picturesque. Now, the audience expects a little more for next year's batch of films. I have never asked myself about that for the past 22 years of my life. 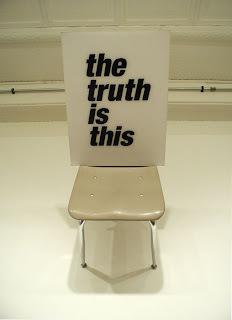 Truth is very abstract, very vague. I know the truth about my sexuality. I know the truth about my family. I know the truth about my love life. I know the truth about my friends and my relationship with them. But one thing has been very doubtful for me, my career path. I haven't known the truth about it after a year of being a young professional. Then a friend suddenly told me, don't just follow your heart, follow your truth. The truth is, I wanna be a writer. I may pass through a different route for now, but I know I'll get there. But soon. In the near future, I will. I am working in a digital advertising agency, but there is still mystery whenever I type my name in Google and my name appears in the very first page result. It still amazes me, puzzles me, boggles me. According to my mentors here in the office, Google has this spider attributes wherein it crawls in all websites, searching for the keyword you entered. However Google does it, the process and the technology in search engines creates the resounding disbelief in me. Even my blog, a not so famous one, this one you're reading, belongs to the top 10 results in Google. It might be just one of the activities we do when we go online, but online searching involves a lot of process and mind-boggling technology than ever thought. So the next time you Google, try to think of how great the people behind Google is. How technologically forward these people are. Now I'm thinking, does anyone here knows their email? I might send my resume. For the kids and the kids at heart, Ice Age 3: Dawn of the Dinosaurs will surely keep you awake from start until the film credits. 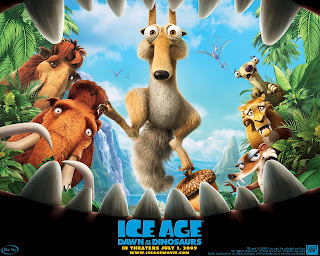 From it's first release on 2002, Ice Age has become an anticipation from those who wants just plain enjoyment. This time, 20th Century Fox releases Ice Age 3: Dawn of the Dinosaurs. Sid, Manny, Scratte, Diego and the rest of the team are back with more thrilling adventures. In search for Sid, who's lost due to his carelessness, rather the feeling of being a mom, Manny, Diego, Crush, Ellie, and Eddie, went out and about to look for him. Now, they find themselves in a middle of fun trouble. The film is really meant for the kids. However, for those who are up for just watching a film and laugh their heart out, Ice Age 3 will give it to you, ice cold and frozen. What I like about the film is its humor, it flawlessly made it's audience laugh and appreciate the extinct age. The characters are strong and coherent, from the first up to this third installment. Truly an ageless Ice Age. After the tremendous success of Facebook, one social networking site, aside from MySpace which is still a choice for the youth of the US, Friendster has lost its fame and became nothing but ordinary. I should admit that before, due to a limited number of friends in Friendster, I had 3 accounts - but none of them has been maintained since Facebook came. However, I still believe that Friendster has the chance of regaining its fame. Philippines is a third-world country. 70 to 80% of our population belongs to the CDE sector, to which Friendster caters. Whenever I visit computer shops around my place, I still see Friendster browsed by internet addicts. Even a friend still prefers Friendster and finds Facebook a headache. I'm not being sentimental here, but Friendster opened our minds and eyes to the world of social networking. Never underestimate the power of the one who conquered the online space first. Where else would you go but to where you were before. There is still that chance, that meagre chance.